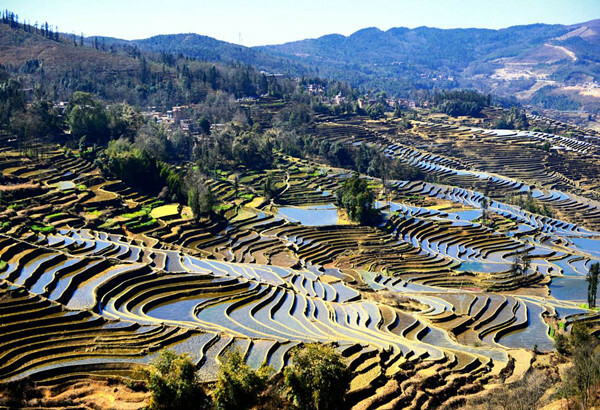 Why Visit Bada Rice Terraces? 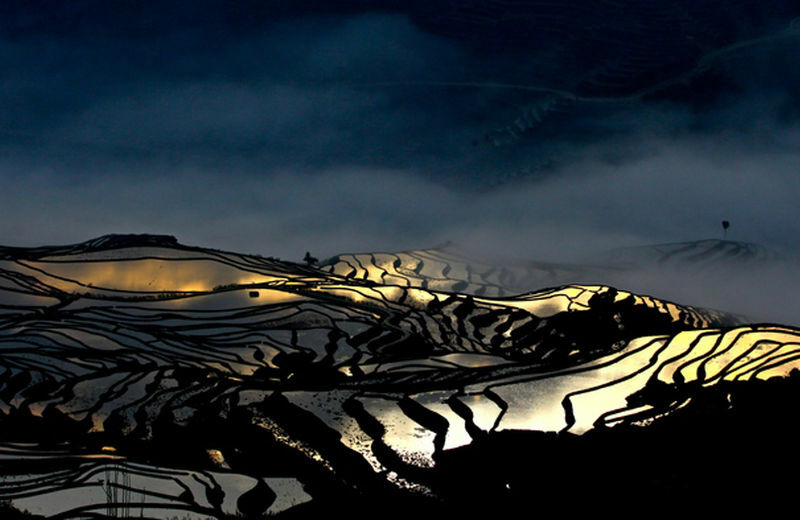 Bada Rice Terraces, a part of Honghe Hani Rice Terraces, was listed as World Heritage Site in 2013. The 950-hectare Bada Rice Terraces is like the ladders to the heaven with over 3700 levels, rising up from 800 meters to 2000 meters. Hence, the words “Vast”, “Magnificent”, “Beautiful Curved Lines” and “Stereoscopic” can be used to describe Bada Rice Terraces. There are some villages including Quanfuzhuang, Malizhai, Bada, Shangmadian surrounded by the rice terraces and travelers can have panoramic view of the beautiful villages when shooting the rice paddies. 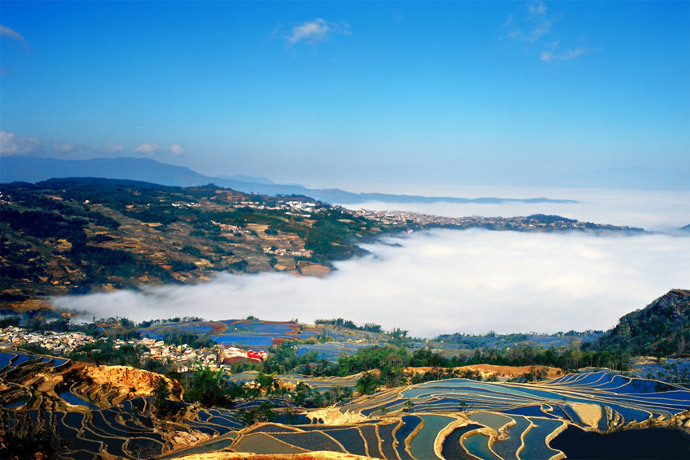 Bada Rice Terraces Scenic Area is a bright pearl in the tourism of Yuanyang, which includes Quanfuzhuang Rice Terraces, Malizhai Rice Terraces, Bada Rice Terraces and Shangmadian Rice Terraces. There, what you can enjoy is the natural landscape, humanities and ethnic flavor of Hani people since thousands of them have been living there generation after generation. It is the best place to entertain the spectacular scenery with stereoscopic and curved line, and also the great attraction to have a profound knowledge, analyses and understanding of the Hani culture. With over 3700 levels, endless terraces are like ladders up to the heaven, rising up from the 800 meters of Malizhai River to 2000 meters of the summit of the mountain. 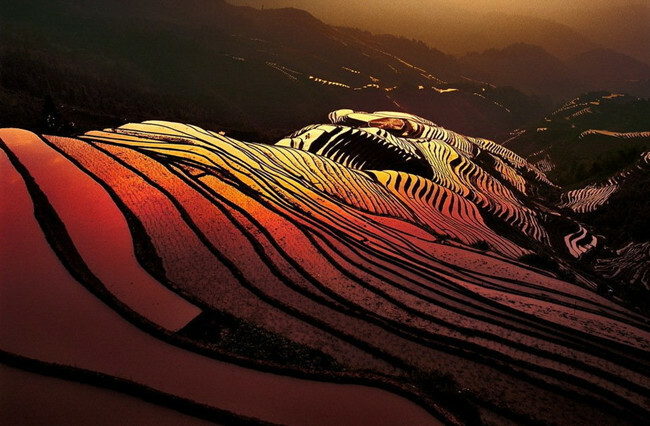 Glittering and shimmering, under the sun, the Terraces are just like a mysterious wonderland. The words “Magnificent”, “Spectacular”, “Grand” cannot express “Bada Rice Terraces” fully. At the dusk, when the sun shines on the 950 hectares rice paddies rising from 800 meters to 2000 meters, the magnificent scene forms, like the latters toward heaven. In the winter time after autumn harvest, the rice terraces are filled with water and when sunset glow shines upon the paddies, the 3700 level terraces first turns pink, then rosy and later dark red, pink, golden and white….The sea of clouds over Bada Rice Terraces add more mysterious feel and when standing on the top of the rice paddies and looking down and around, you only have to say “This is the most spectacular rice paddies I have ever seen”. That’s the magic of Bada Rice Terraces. Bada Rice Terraces has two viewing decks that offer views at similar heights but different lateral perspectives. One viewing platform faces the sun directly and when you take pictures of the rice paddies, the ridges of the rice terraces line in vertical scene. While, the other viewing platform offers side view of the spectacular rice paddies. There is a footpath from the first viewing deck leading to the second viewing deck. Travelers or photographers can try both locations to photograph amazing pictures. The sun goes down during 18:00~20:00. In the spring time (March to May), it is usually during 19:10~19:50, in summer (June to August) at 19:25~19:57, in autumn (September to November) at 18:20~19:26 and in winter (December to February) at 18:20~19:11. If you are professional photographers, you’d better get to Bada Rice Terraces at 16:00 and find a good location for some great pictures with rice terraces, sea of clouds, Hani villages and sunset. Travelers can come all the year round and for photographers, the best time is from November to March of next year. Dusk: At dusk, it’s best to appreciate Bada Rice Terraces. When the sun shines on the rice paddies of 950 hectares from 800 meters to 2000 meters, the amazing view may shock or thrill you. Winter: Visiting Bada Rice Terraces in winter is definitely a perfect trip. 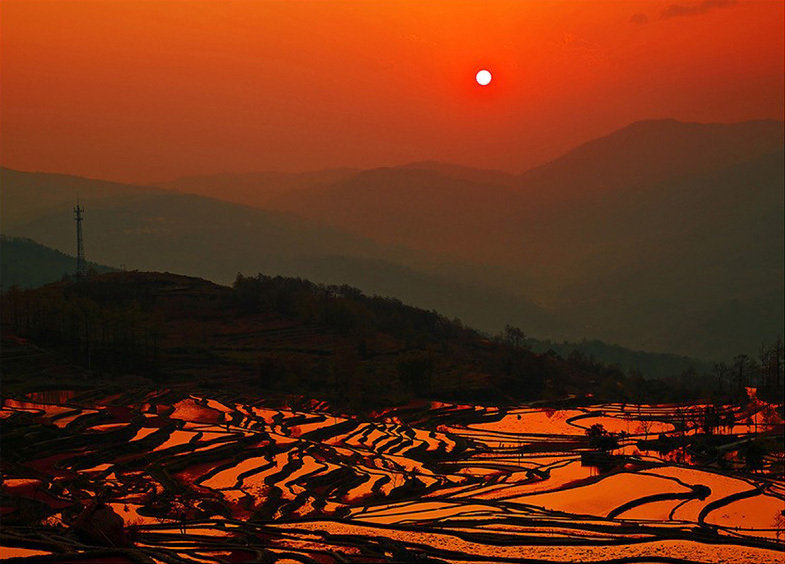 The rice terraces are full of water after autumn harvest; when sunset glows softly upon the paddies, the terraces first turns pink, then rosy and later dark red, pink, golden and white at length. Bada Rice Terraces is about 16 kilometers from Xinjie Town (the old town), 46 kilometers from Nansha Town (the new town) and about 375 kilometers from Kunming, the capital of Yunnan Province. Travelers can take bus from Kunming to Yuanyang Xinjie Town or Nansha Town first and then transfer to Bada Rice Terrace from Xinjie Town by local minibus. Kunming to Yuanyang: From Kunming South Bus Station, there are direct long distance buses to Yuanyang Xinjie Town, running schedules around 10:20, 13:30, 19:30 and 20:00. There are buses at 09:05, 12:30 and 18:30 from Yuanyang Xinjie Town to Kunming. It takes about 7 hours between Kunming and Yuanyang. Nansha Town/Xinjie Town to Bada Rice Terraces: Travelers may take long distance buses to Nansha Town or Xinjie Town from Kunming, Jianshui, and no matter which station you arrive at, travelers can take local minibus to Bada Rice Terraces. It takes about 1 hour from Nansha Town to Xinjie Town and 20 minutes from Xinjie Town to Bada Rice Terraces. It is better to arrange two or three hours to visit Bada Rice Terraces, we provides tourists with some tour routes to choose. Kunming South Passenger Station: departing for Yuanyang, Xinjie Twon, at 10:20/12:30/19:00 every day, CNY 139 per, lasting 5 to 6 hours. Then you can rent a car to reach Laohuzui Rice Terraces, CNY 5~10 yuan per. Take a chartered car: CNY 300 a day to visit around Yuanyang Rice Terraces, and about CNY 100 to get to Laohuzui Rice Terraces. Take the regular bus from Kunming to Nansha county, then take the mini bus to Xinjie town(CNY 10 per, departing from 7:00~20:00). From Xinjie town to the entrance of the Yuanyang Hani Rice Terraces or from the entrance to each scenic spot, you can rent a car to go, CNY 5~10 per. Kunming East Passenger Station: leaving for Jianshui or Gejiu and costing CNY 85 per and 3 or 4 hours and a half. And train from Kunming to Jianshui is also available. Then you can take a regular bus to Yuanyang, CNY 16-32 per. Bada Rice Terraces has two viewing decks that offer views at similar heights but different lateral perspectives. One viewing platform is faced with the sun directly so when you take photos of the rice paddies, the ridges of the rice terraces are in vertical scene. The other platform displays the side view of paddies. Between two viewing decks, there is a footpath. Either of them is a good choice for photographers. Hani people would celebrate some traditional festivals, like Hani New Year, Kuzhazha Festival, etc. Hani New Year is like the Spring Festival of Han. It takes place in the first Dragon Day of the 10th lunar month each year and lasts 5 to 6 days and even as long as 13 days. Every family would prepare chicken, pork to worship their ancestors and family members gather together to enjoy the union. In the last day of the New Year, a Long Table Banquet will be arranged and tables will be laid in the street which can extend to one kilometer long. Each family will serve the most sumptuous dishes to fill up a table and enjoy the banquet together. Kuzhazha Festival takes place from lunar June 23 to 26 and every family makes sticky rice, sets the feast, makes fresh rice and worships the ancestor. Ticket One: It is valid for 3 days. It is 100 Yuan for per person, including four scenic spots Jingkou Folk Village, Bada Rice Terraces, Duoyishu Rice Terraces and Laohuzui Rice Terraces (Tiger Mouth Rice Terraces). Ticket Two: It is valid for 10 days. It is 180 Yuan for per person, including four scenic spots Jingkou Folk Village, Bada Rice Terraces, Duoyishu Rice Terraces and Laohuzui Rice Terraces (Tiger Mouth Rice Terraces). Ticket Three: It belongs to annual ticket which is valid for one year. It is about 360 Yuan per person, including four scenic spots Jingkou Folk Village, Bada Rice Terraces, Duoyishu Rice Terraces and Laohuzui Rice Terraces (Tiger Mouth Rice Terraces). There is one 3-star hotel called Yuanyang Yunti Hotel in Xinjie Town and travelers are recommended to spend your night there. Besides, there are many hostels in Xinjie Town and other scenic areas and if you want to find a hostel with basic facilities close to the scenic area, you’ve got a lot of choice. The weather forecast of Yuanyang on the Internet may be not exact because the weather of the rice terraces area is always changeable and unpredictable. The temperature here varies greatly between day and night. Please pay attention to keep warm especially in early morning and at night.